Which growing media works best for growing strawberries? Well, there are a few options including soil. People have grown strawberries successfully in media like Rock-wool, Perlite or Bark. Here in this article, I want to talk about coconut coir as a media for growing strawberries and why it is the best of them all. The traditional way of using soil as a growing media for strawberries has one major disadvantage and that is the pathogen problem. Unlike normal soil, coconut coir is not infested with any harmful fungi. On the contrary, coir is enriched with Trichoderma. 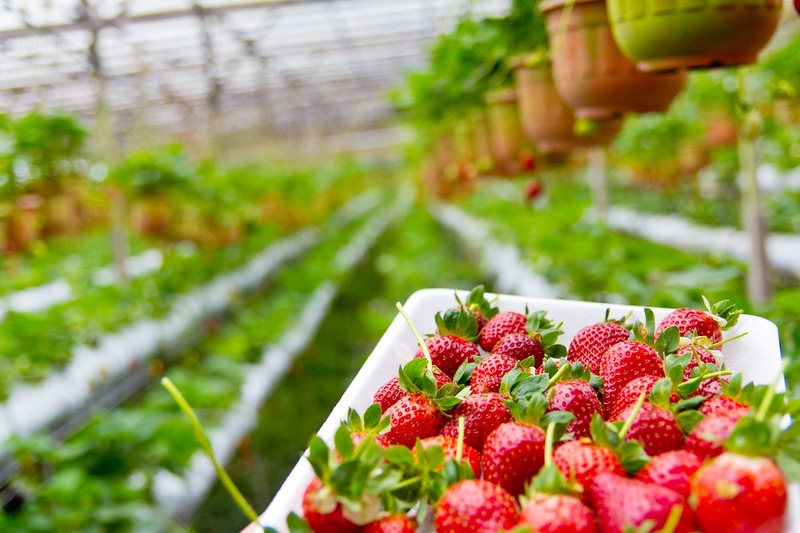 Research has shown in the past that these fungi help reducing anthracnose disease in strawberry plants and thus work as a great substitute for traditional chemical uses in the strawberry field. As a result, you do not need to fumigate or use any other such methods which pollute the environment to disinfect the media. Coconut coir is high in lignin. This organic compound helps in the development of beneficial bacteria which in turn reduce the propagation of harmful ones in the media. These beneficial bacteria remain in symbiotic relationship with the plant and thus increase the overall productivity. The water retention capacity of the coir goes very well with the plant. Planting strawberries in coir require less frequent watering and also eliminate the problem of water logging (due to its excellent drainage capacity). Strawberries require a considerable amount of oxygen in their root zones. So it is inevitable that the media for growing strawberries should have a good aeration property. That is one of the reasons that coconut coir is considered an ideal medium for growing strawberries. The high level of aeration and fantastic drainage property encourage the plant roots to develop its full potential. Vertical towers are becoming more and more popular these days among gardeners, especially in urban areas. Using coir in place of soil will also make the towers lightweight and easier to transport. Besides the high buffer capacity, coir also ensures the slow release of the nutrients for an extended period of time and thus optimize plants growth. Due to these attached benefits, coir has been broadly in use in greenhouses. They have increased the productivity quite a fold. Strawberries require calcium for their growth. So before buying any coir please check its labels. Normally coir doesn’t have a lot of calcium in it. But as an amendment, some companies have decided to add calcium in their buffered coir media. If your coir doesn’t have added calcium you might need to add gypsum or perlite to make it suitable for growing strawberries. A potting mix consisting of coconut coir, perlite and compost are ideal for growing strawberries. One of the best combinations is 50% coconut coir with 30% perlite and 20% compost. For other information about growing strawberries check out our earlier article. What do you think about the article? Express your views by using the comment box below. Someone mentioned that I would need to amend my coir extensively with various other products since coir doesn’t have nutrients like soil does. My intention was to use a coir perlite mix and water every other week or so with Miracle Grow. This is my first time usi ng coir and I’m planning on growing strawberries on my porch with a vertical garden. Should I be investigating all these other supplements, or is my initial intention ok? This is my first time growing strawberries, or using this growing medium.